If it is one of those days when you want to stick around town rather than spend time in the car searching for an adventure, why not venture down Highway 12 to Boyes Hot Springs. There is a ton of fun to be had at minimal cost and with air conditioning! For your first stop visit Barking Dog Roasters. If your night was like mine with a baby waking up ever couple of hours, then you’ll want to start off at Barking Dog Roasters. This family owned and operated neighborhood gem makes coffee drinks a form of art. With an eye for detail, Barking Dog even makes their iced coffees with coffee ice cubes as not to dilute the flavor. During the holidays the list of flavored coffee drinks is literally a page long. If you prefer tea, then try their chai made by a Sonoma County local with either a sweet or spicy flair. I highly recommend one that is half spicy and sweet. With a tot spot for little ones, Barking Dog is completely kid friendly. 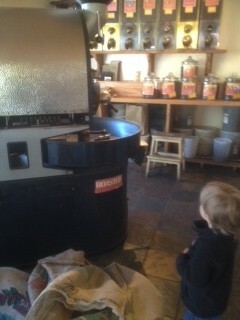 Rather than enjoy the toys or kiddie sized table, however, Bobby prefers to climb on the bags of beans or marvel at the super huge robot (coffee bean roasting machine). On Tuesday and Thursday mornings you can even see the huge coffee roasting robot machine in action. Come mid-July, we’ll be stopping by the Barking Dog for pulled pork, brisket, tri-tip and chicken sandwiches with the usual BBQ sides. For your second stop take the kids thrifting! You can even bring a few things to donate thereby creating an opportunity to teach the kids about recycling. During your visit have the kids find a couple of books or toys to take home. I recommend visiting either The Republic of Thrift or Church Mouse. Of course if you prefer new things, there is always the Dollar Tree, another spot filled with affordable treasures. For your third stop enjoy a sweet treat. Michoacana Natural Ice Cream offers deliciousness at every turn. The treats here are not to be missed. From fresh fruit popsicles to light creamy ice creams, Michocana has something for everyone. 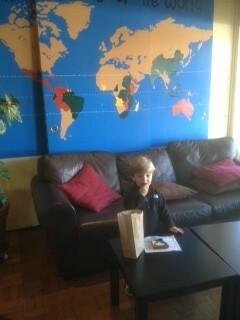 Bobby highly recommends the chocolate; its subtle flavor is wonderfully refreshing on a hot day. If the weather has cooled down by the end of your sugar stop, then let your kids run off their sugar high at Maxwell Park and call it a day. This entry was posted in adventures, sonoma, Uncategorized and tagged sonoma, summer adventure on July 9, 2012 by Modern Mama.